TEGOPAC® Bond 160 by Evonik is a silylated polymer used for producing neutral curing adhesives and sealants where low formulation viscosity or very high filler load is required. 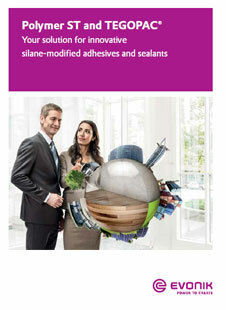 Applications include liquid membranes (roofing applications) and flooring applications (parquet adhesives). It is based on a unique polymer technology with lateral crosslinking groups. Exhibits excellent- through cure properties, elastic recovery properties, intercoat-adhesion/overcoatability, improved water & thermal resistance and excellent. The low polymer viscosity allows quick & easy handling. Due to the reactive groups in lateral position, curing starts in presence of moisture and a catalyst. Ethanol is released during the curing process. 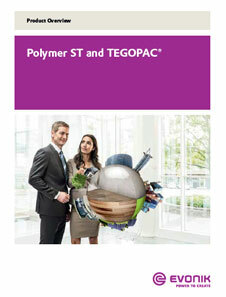 Methanol-free formulations with self-levelling properties or high filler load can be made using TEGOPAC® Bond 160. It is free of solvents or plasticizers. A standard chemical drying agent (e.g. Dynasylan® VTMO or VTEO) can be added to the formulation while processing. It has a shelf life of 6 months.